São Paulo is a chaotic megalopolis: more than twenty-one-million inhabitants in its metropolitan area face pollution, traffic, violence, repression, discrimination and inequalities of many sorts. All these problems and contradictions are, somehow, imprinted in (and coming from) its very spatial fabric, in the way it has been built and destroyed by the many waves of projects within so-called development and progress efforts throughout the years. 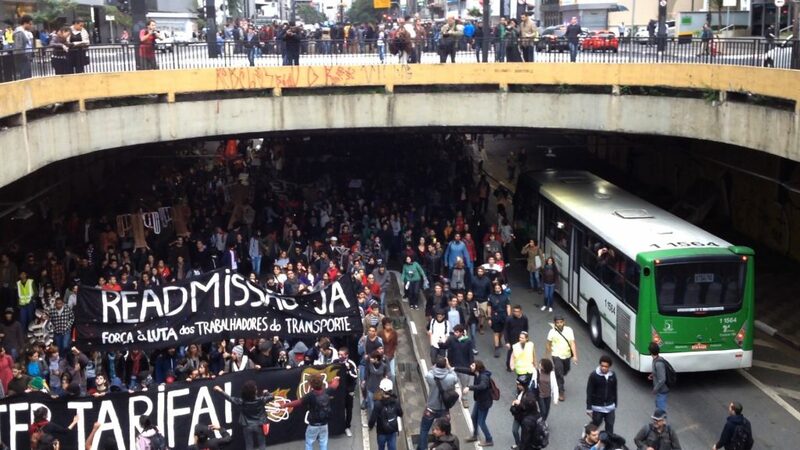 Paulista Avenue is not immune to this. It started as a rich neighborhood where the coffee-plantation owners built mansions when they came to the city from other parts of the state in the late nineteenth century. It was there that they would gather for socializing, in places such as the Trianon Park or later around Augusta Street. European influences could be perceived everywhere, especially in the neoclassical architecture of those houses. Right from the start, it was a space for exhibitionism, for ostentation—real-estate ostentation, wealth ostentation, cultural and political ostentation. But over time, the avenue evolved into a new social, economic and cultural center for a city eager for modernization. The exodus from the old historical center of the city to Paulista Avenue was partially responsible for the decline of the first. Soon, the former mansions of the coffee barons were demolished to make room for new postmodernist skyscrapers. The avenue was enlarged, gained a new layer and, consequently, an underground gallery (like tunnels), that never was open to the public. From its initial configuration as a nineteenth-century avenue, only two or three houses remain today. As Paulista Avenue became a key place of public life for São Paulo and the financial core of the country, in in the 1980s it became a major space for political rallies, with the end of the dictatorship and the reinstatement of democracy. It started to be recognized as the heart of the city and its postcard too. As perhaps the main landmark of São Paulo, Paulista Avenue manifests all the contradictions, frictions and tensions of a rich and also unequal city. In this complex space, many artists in diverse periods dove in, producing urban interventions that tried to make visible the contradictions that move Brazilian society. In spite of the vast range of important themes being touched upon by the works on show—passing through social and economic contrasts, financial capital and informal trade, symbolic capital and cultural institutions, political demonstrations and matters of gender and sexuality (the avenue hosts one of the world’s biggest LGBT pride parades)—their scope is not a challenge to the viewer per se. What challenges the museum’s visitors instead is the spatial display used in the show. Claiming to reconsider the many different clashes and disputes staged on this iconic avenue, the display itself creates a quite chaotic environment, similar to what one may experience in many parts of the city. A sense of a lack of space and of a dispute over it echoes the dense juxtaposing of works in a nineteenth-century French saloon. Not to mention the difficulty in understanding the logic of organization and relationship among the works, obfuscated also by the massive quantity of them and a supposedly apparent (but not so coherent) coexistence. 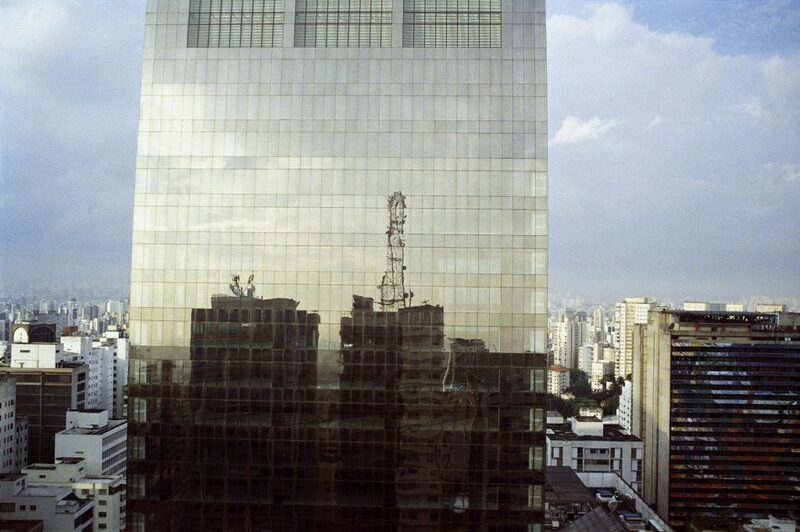 What can be seen as the major problem of the show, or its challenge, becomes—intentionally or unintentionally—the very evocation of how São Paulo functions as a city. From another standpoint, the dialogue between the show’s two major organizational segments imposes another level of challenges to the spectator. The first sector, which is situated in the left and back walls in the first-floor gallery, comprises historical works of thirty-eight creators, starting with one of the first images of the avenue—a 1891 watercolor by Jules Martin, representing the festivity of the avenue’s inauguration, eventually followed by, more than a century later, the collection of all the posters of the LGBT Pride Parade that have happened there in the last twenty years. This sector is chronologically arranged, but I wonder if it would not be better organized in terms of creating and linking situational recurrences, confrontations in a different manner other than that of a historical linearity of events. The second segment is composed of fourteen new projects commissioned for the exhibition. They occupy the entrance hall, the center, and the right part of the first-floor gallery, the basement gallery, the sub-basement video room, the external free span as well an intervention on the second-floor collection gallery and some unrealized works that are present in the show as printed-matter projects and reproduced in the exhibition’s catalogue. It’s difficult to navigate through these different (but somehow complementary) proposals, which mostly evoke and even propose interventions that are unlikely. Let me explain: for example, the three massive works on the main exhibition floor seem like interesting propositions, but with a clear inclination towards the idea of spatial or urban interventions. The strange cabin-like work by Marcelo Cidade references the popular galleries and bric-a-brac shops that are present on the avenue, presenting an appropriation of one of those displays to show a rotating egg. Seeing it in the gallery is one experience, but it certainly would have a quite strong presence among other real shops, a challenge that the work seems to deserve. Andre Komatsu and Cinthia Marcelle’s floor works follow the same logic: while Komatsu’s piece deals with different types of stones used on sidewalks and introduces the word obsolesce–referring to the decay and failure of certain urban situations–it could create more friction if situated outside the museum, in its famous free space, or even in an original sidewalk. Marcelle’s cataloging of found materials in the avenue (small things and garbage) could create a link with the museum’s collection and the ideas of value and the impositions of certain taxonomic standards. Even if we ground these works by the common theme of bringing the street to the museum, such a a justification is not sufficient, as the way these works are shown imposes a certain domestication on them by the institution–which becomes clear when we try to connect them to other historical interventions present in the wall just besides them, for example some of the actions made by 3Nós3 group, or even Cildo Meirelle’s golden nails buried almost invisibly in the avenue. Stepping back, one could ask if it is the institution that would foster such types of interventions (and support their risks) or if it is precisely the institution that constrains them, echoing how the city itself is negotiated and over-controlled nowadays. Nevertheless, there are also other works to look at: Luiz Roque’s “S” film, shot in the subway underneath the museum, dealing in a poetic manner with gender issues (in Brazil, more than a hundred of transsexuals were brutally assassinated in 2016), or Daniel de Paula’s installment of parts of the old large-scale avenue’s luminaries into the museum, as well the private and domestic atmospheres evoked by Mauro Restiffe’s timeless photographs of apartments in the avenue, which somehow demystifies its financial aura. In Graziela’s Kunsh video register of a clash between a political rally and the oppressive and violent police forces of the city, the video projection acts as an eyewitness type of video documentary, while some big grey and abstract volumes are displayed along the projection. After a while, we may perceive them as references to the ramps built by the municipality in various places to prevent homeless people from sleeping underneath bridges and passages–an urban device of oppression and gentrification. The original idea of Kunsh seemed to be also an intervention: to make a real cut in one or two of those ramps that are near the museum, in the avenue, to bring them to the show. Obviously the municipality would not agree to that since city is engaged in a campaign called “Beautiful City” (cidade linda), in which one of its first public actions is painting over as many graffiti walls as possible with a truly sad mid-grey color. Probably one of the most striking propositions is an unbuilt work by Renata Lucas: a phrase to be written in the façade of the buildings located down the valley near the museum, saying “here there was a project of city” (a work from where I borrowed the title of this text). In the show, the project is communicated as a pile of posters displayed in front of the only curtain-free window in the main collection gallery, allowing one to imagine the phrase in the city. Due the work’s large scale, the involvement of so many buildings, bureaucracy and actors, it might not even come to be finished. But this is a minor fact. What is really interesting is all the processes, negotiations, understandings, agreements and so on that would allow (or not) the work to be produced, mirroring somehow the way urban interventions and projects are also made. “Avenida Paulista” has also a very rich weekly program comprising thirteen workshops and eight movie screenings. The workshops—conducted by theater groups, collectives, architects and artists—take the avenue as a stage and creative space, activating its history and memories. The movie screenings, organized by the artist Dora Longo Bahia along with the study group Depois do Fim da Arte (After the End of the Art), take place in the museum’s small auditorium in the basement and ponder the artist’s place in the city. If these activities could have been moved more towards the “center of the show’s curatorial project,” it would have changed the focus from the display of objects towards the permeability of relations that are created with and through them and the space–and by extension, the city itself in the same way. In the end, the show may gain another level of reading if considered as a contradiction of the very foundations of the museum as inherently idealized by Lina Bo Bardi in its essential features—transparency, permeability, copious use of glass, free plans, and the suspension of a major concrete volume. All are exceptions to the rule in the city, in the ways things are built and done in this so-called concrete forest which is Sao Paulo. If the museum was conceived as an idealized place to mirror what the city (and its society) could be, “Avenida Paulista” the exhibition is quite the opposite: truncated, a little confused, blurry, overlapped and opaque, offering an aesthetic experience that echoes the sequence of attempts, failures and clashes which are the very way of life in this city.